From the beginning of 2011 to May 2013, Alvin, the U.S. science community’s only human-occupied submersible dedicated to deep-sea research, underwent a thorough overhaul and upgrade to greatly enhance its capabilities. In the end, the iconic sub was redesigned and rebuilt, piece by piece, by a one-of-a-kind team of engineers, technicians, and pilots at WHOI. 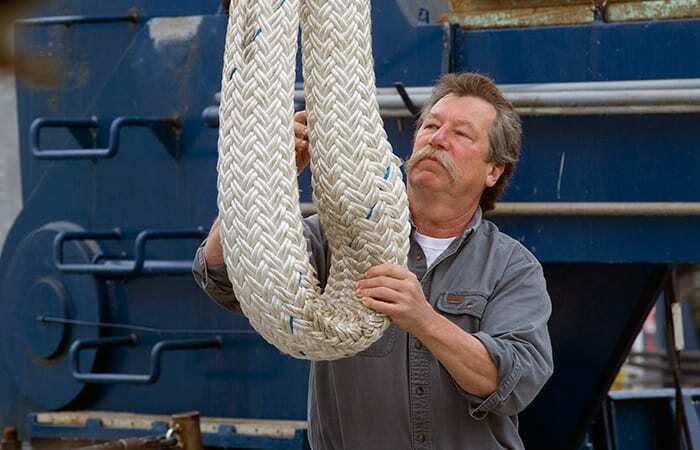 Here, Port Engineer Dutch Wegman talks about the massive rope used to lift and lower Alvin. That big old rope you see there is the lift line for Alvin. The line is 86 feet long, with a 3-foot eye, or loop, on one end. It goes around the ‘T’ on the submarine. It’s a big T-shaped piece of titanium that stands up vertically on the submarine. The rope comes down and the swimmers lay that loop around the T. Then the winch on the A-frame on the ship’s stern lifts the submarine up. A metal latch hooks onto the T and then the A-frame travels the arc from over the water to over the ship and lowers the submarine down and sets it onto the cradle on deck. The lift line is the dividing point between responsibilities of the Alvin Group and the Port Office. Below that is the submarine, and above that is our responsibility. We and the Alvin Group were both doing our own thing—they’re making the sub and we’re picking it up—but we had to work together. Upgrading the lift line was a long process. We had it made by Samson Rope. This is 5-inch diameter line, made of polyester. It weighs 788 pounds for every 100 feet. It’s the largest rope they make. It has these intersecting braids all the way through it—braid inside of braid inside of braid. It’s wonderfully soft. You can take this and pick it up and push it—you see how it’s expanded right there? It’s like one of those Chinese finger things. So it’s actually very nice and soft and sweet to work with. It’s very, very strong for its size. The Navy requires a 7-to-1 safety factor in lift lines for manned lifts. That means it has to be able to hold seven times the weight of the sub, or about 350,000 pounds. We have no way of testing this line, so we ordered one very long piece, that Samson cut up into three sections. Two were like this one, and the final section was 40-some feet long with an eye on each end. They sent that one out to another company that break-tested it and got us the ultimate strength of the line. It went up to 651,000 pounds before it broke. The blue structure behind me is one of the uprights of the A-frame, the part that is bolted to the deck. That round piece at the far left is the pin assembly that the whole A-frame pivots on. The ladder steps go all the way up to the top of the A-frame. There’s weekly maintenance that you have to climb up there and do—greasing and check on the brakes and that type of thing. Alvin is owned by the U.S. Navy and operated by WHOI. The current upgrade has been funded largely by the National Science Foundation, with support from private donations to WHOI.